Yes, it’s true that I haven’t posted in a very long time. I’ll tell you another time what all I’ve been up to. 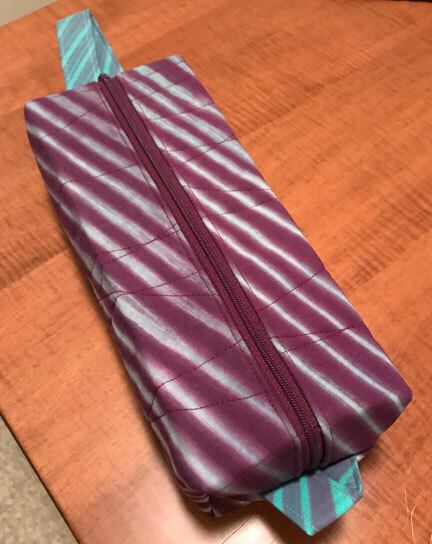 One thing I’ve done is take Joan Hawley’s “Zip It Up: Easy Techniques for Zippered Bags” class on Craftsy. If you’re just getting interested in crafting cool bags for yourself, friends, and craft shows, I highly recommend this class. The fabric is hand dyed using Shibori techniques by my friend, MaryLou Alexander. You can see the beautiful art quilts she makes with her hand-dyed fabrics on her website. Aren’t I lucky that she calls me when she’s overloaded with scraps? This bag is one of the results. The bag will be a holiday gift to my travel pal, Marilyn, when we go to dinner with MaryLou and our guys tonight. Happiest of Holidays to you and yours, whatever you celebrate. May you make wonderful memories.